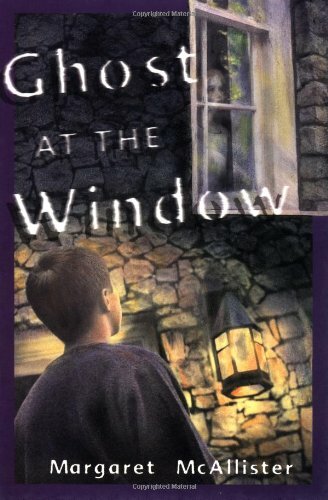 Ghost at the Window by Margaret McAllister is a historical fantasy for children. It is an interesting novel about a quirky house that time shifts and how a young boy tries to help a girl from the past move on to death. Ghost at the Window is set in contemporary Scotland. There is little in young Ewan Dart's world that is normal or stable. His photographer mother is gallivanting around the countryside and his artist father is so tuned into being creative that he seldom notices the real world. Not only is his home life unstable, but so is his home. Built more than a thousand years ago it easily slips between the centuries leaving anyone who enters the house unsure of when, what, or who will be there. Luckily the switches are quick and contact between eras is limited. That is until Ewan encounters Elspeth in his room. Elspeth can not only see Ewan, she can interact and communicate with him. It seems that Elspeth became trapped in a time switch just at the moment of her death from diphtheria in 1937. Since then she has been waiting for someone to aid her to cross over to "the music" (similar to passing into the light.) Each time she flashes into the moment of her death something prevents her from crossing over. It is her hope that Evan can help her. Evan sets out to find out who Elspeth is and what might be holding her from leaving. Ghost at the Window is well written but very light in emotionality. The characters are well drawn, but the plot seems secondary to them. The house's time switching is accepted by everyone in the same way one might accept a flickering light…annoying, but normal. It was hard for me to just accept people walking into their home and finding cattle or medieval knights in the living room without being more disturbed or upset. This may work for others, but did not for me. Young readers might readily identify with the characters' fear of the unknown in closets. I am not sure that this book will help them overcome it. Otherwise the book was enjoyable and a rather picturesque read. Margaret McAllister an author of many children's and young adult novels. A popular author is the United Kingdom, only a few of her novels have appeared in the United States. These include A Friend for Rachel (1997), The Fire Lion (2001), Ghost at the Window (2002), The Secret Mice (2002), and Hold My Hand and Run (2002). Her most recent US release is Octave of Angels (2004). Margaret lives in North Yorkshire, England. Ghost at the Window by Margaret McAllister is an enjoyable fantasy novel. The book is recommended for ages 10 years and up.